A well-presented first floor purpose built one bedroom apartment in the very heart of Bristol City Centre. No onward chain making a prompt move possible. 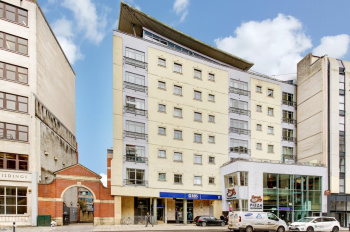 The apartment is set in a highly desirable and convenient location in the very civic heart of Bristol and close to the harbourside with a range of bars, restaurants, shopping and Temple Meads station. Local attractions including @Bristol, Blue Reef Aquarium, Millennium Square, The Bristol Old Vic Theatre, Bristol Hippodrome and Colston Hall and the Cathedral are all within 1km. One of 46 apartments over 7 floors which provides a pied a terre life style with amenities on your very doorstep. Accommodation: open plan living/kitchen/dining room, bedroom and bathroom/wc. Intercom entry system with lift access. No onward chain making a prompt move possible.